As many social critics are just now discovering the racial treatise W.E.B. DuBois advanced more than 100 years ago, the academy continues to devalue, marginalize, and ignore specific voices while choosing to champion, protect, and canonize others. This exclusion allows, or directs, each generation of new scholars to carefully dance around the real problems in education by judiciously repackaging the discourse of their predecessors. This is not to suggest that the intellectual past of a discipline should not be revisited. This does suggest that some aspects of that past, a past often marred by cultural incompetence and the intellectual marginalization of specific groups a discipline pretends to be educating, needs to be considered and critiqued by those groups the discipline has objectified and transformed into others. Intentionally connecting educators to the history of Black self-determination in education may potentially serve to assist in the creation of pedagogy and programs to address the challenges of Black males in education. Maulana Karenga (2002) reminded us to practice Kujichagulia (self-determination), and explained Sankofa as an instruction to, “reach into the past, recover its richest lessons, most instructive models and best practices, and put them in the service of the present and future” (p. 65). Grounded in Carruthers’ (1999) discourse on Intellectual Warfare, this chapter was used to challenge the conventional wisdom and develop an intellectual space that invites marginalized voices/stories to enter the discourse concerning the education of Black males and the practice of Kujichagulia. 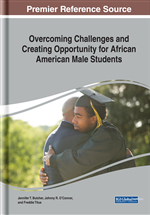 In this chapter, the specific intent was to examine the meaningful ways that Black people have demonstrated self-determination using innovative educational practices—developed out of necessity—in the face of overt, structural forms of racial oppression—to secure educational opportunities for their children. Moreover, the chapter was designed to address the exclusion of important historical voices, unique perspectives, and lived experiences that have often been relegated to a few sentences, if mentioned at all, outside of Black studies disciplines. ART: The intellectual, physical, and spiritual practice of producing that which is most advantageous to personal and community development. African-Centered: An epistemology derived from the cultural continuum of African peoples throughout the Diaspora. Sankofa: A critical negotiation with the past in recognition of significant lessons to be used to improve current conditions. Reimagining: The practice of critically assessing one’s current condition, through multiple frames, as a means of intellectually repositioning the self in a manner that is most conducive to success. Black Studies Curriculum: A deliberate pedagogical praxis dedicated to the critical study of the Black experience throughout the Diaspora. Kujichagulia: The deliberate and persistent actions required to achieve one’s goals despite the presence of systemic inequalities. Black Genius: A recognition of the collective survival of Black people in the face of systemic atrocities designed for their demise.